Last weeks sculpted cake project was a replica of Sly Stallone after his 'Rocky 4' winning fight. I love sculpting and creating features and faces, but faces of an actual person... well, I usually steer clear. This type of work, whether using a pencil, clay or cake, has always been outside of my comfort zone. But, once in a while we have to stretch out a little... Don't we? I started the concept by drawing a to-scale line drawing, this helps with overall measurements and to ensure the structure is built correctly. The structure to support him was constructed, and the vanilla sponge and decedent chocolate buttercream we made in preparation. Layers were stacked, then carved down (with a-lotta wastage that I may have snacked on), until a semblance of a torso existed. Chocolate modelling paste was then wrapped around the cake, ready for more layers of 'muscle' to be added. Now, for me this was the part of the cake making that had its perks. I thoroughly 'researched' the male form, muscles were a must. 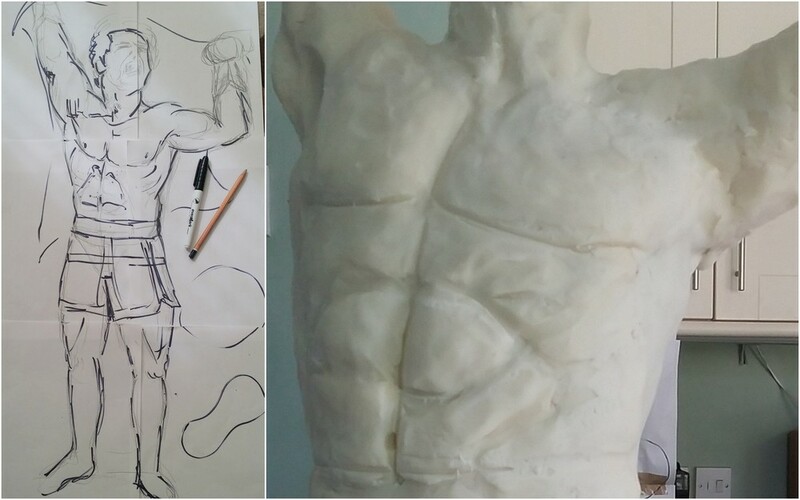 Images of flexing, twisting and punching were saved and stored on my handy netbook, ready to surround me, I mean, aid me, while I sculpted the body. Left: To scale line drawing. Right: The initial beginnings of the torso. There was a lot of too-ing and fro-ing with the muscle positions and shape, a few too many cuppa's sipped while I contemplated what needed to move where. Once I was happy with his body, the task of creating a face began. I needed to get his head started the day before delivery so that I had a chance to 'walk away', sleep on it, and assess in the morning. It helps me look at shapes and similarities with a fresh eye and see what needs to change to give more of a likeness. Above: The first stages of his face. The next morning was spent refining his features, with the addition of his 'stars and stripes' shorts and the iconic flag. Colour was initially added using paint brushes with edible paint. Painting on chocolate is very different to working on fondants, as the oils will cause the paint to bead up. Over the years I have practiced with varying techniques and materials and found a way to apply intense colour without the worry of beads or diluted colour. The flag was made using gumpaste, handpainted and then applied to Rocky before the gumpaste dried out too much. The risk of cracking would have been too great if the gumpaste was allowed to dry. After 10 hours of working on Rocky, he was completed. All finished, bruises and all. I must say, I really do love him. Although he was a real test and put me way outside of my comfort zone, I am really pleased that had the opportunity to make him. Moral of the story: Sometimes you should do what scares you.